We know that for some families, making the move to in-home care for ailing loved ones can be a difficult decision. You are faced with the fact that your relative is getting older and may not be able to take care of themselves, and hiring outside help for someone you love can be scary. It is normal to feel this way before seeking the help of professional home caregivers, but choosing the right company is the first step in providing quality care for your loved one. Best In-Home Care is a family-run business that provides professional, educated, loving, and passionate caregivers for in-home care in Lubbock, Texas. Myth #1 – Professional caregivers don’t care about their patients. Why it’s only a myth: Professional caretakers dedicate their lives to caring for people they aren’t even related to! 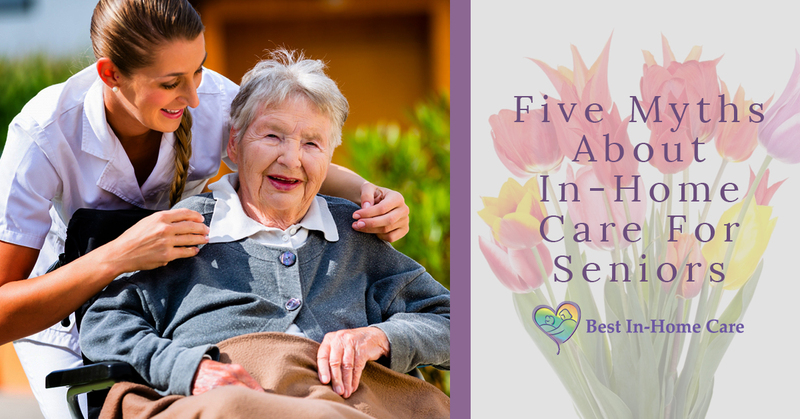 Just like a teacher, doctor, nurse, or other person in the caregiving profession, these caregivers love their patients and are committed to helping them live their best lives – that’s why they got into the business. Being a caregiver is a lot of work, and these passionate caretakers wouldn’t be doing this if they didn’t love what they do. Myth #2 – In-Home care is only for really sick people. Why it’s only a myth: While seniors who suffer chronic illness may need in-home care, this type of care is really for anyone. Many seniors need assistance doing daily activities, such as household chores, personal care, and running errands. Best In-Home Care provides caregivers for all levels of assistance. Myth #3 – In-home caregivers cannot provide 24/7 care. Why it’s only a myth: Many people believe that if their aging or ailing parent needs around-the-clock care, then their only option is to put them in a nursing home. But that is simply not true. Best In-Home Care services are available for anywhere between a few hours a week, to 24/7 live-in care, depending on the needs of your loved one. Just because someone needs professional care day and night, doesn’t mean that they need to leave the comfort of their homes. Myth #4 – Home care is too expensive. Why it’s only a myth: The price for in-home care and full-time facility care is actually quite comparable. Also Best In-Home Care accepts the Veterans’ Benefit and most long-term care insurances. Contact us to find out if your loved one is covered! Myth #5 – I don’t need help taking care of my loved one. Why it’s only a myth: Caring for an aging loved one shouldn’t be a 24-hour job. We don’t expect our caregivers work 24 hours straight, and neither should you. Constantly being “on-call” for your loved one can be detrimental to your health and happiness because you need time to care for yourself as well. Our home health care program offers respite care for those who have taken it upon themselves to care for their loved one. If you are looking for quality, professional in-home health care in Lubbock, Texas, Best In-Home Care is for you. It says right in our name that we are the BEST provider of in-home health care for seniors and ailing loved ones. Help your loved one retain their freedom and independence by scheduling a free in-home assessment today!